Can You Guess Ted Cruz’ Favorite TV Journo? 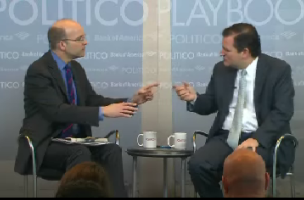 During a Politico Playbook Breakfast this morning, Mike Allen asked Ted Cruz if he has a favorite newscaster. At first Cruz begs off, saying he doesn’t really watch TV. And when Allen presses him, he gives a pretty obvious answer for a Tea Party Republican from Texas: Sean Hannity. ALLEN: Who is your favorite newscaster? 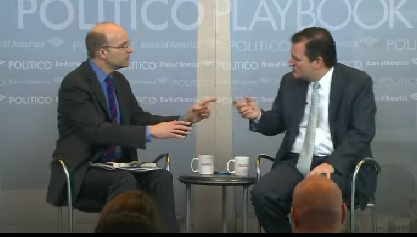 CRUZ: Oh, listen I’m – you know unsurprisingly if I am watching something it’s probably Fox news. I like, I am a big Sean Hannity fan. I wouldn’t call him a newscaster necessarily but I think Sean has a fearlessness that is welcome. I wish you saw – I wish you saw. But then he offers up a name that might surprise you. Find out which other TV newser Cruz admires after the jump.